I was about three months into my journey, sitting at an outdoor cafe in Phnom Penh and drinking a beer, monopolizing the wifi. 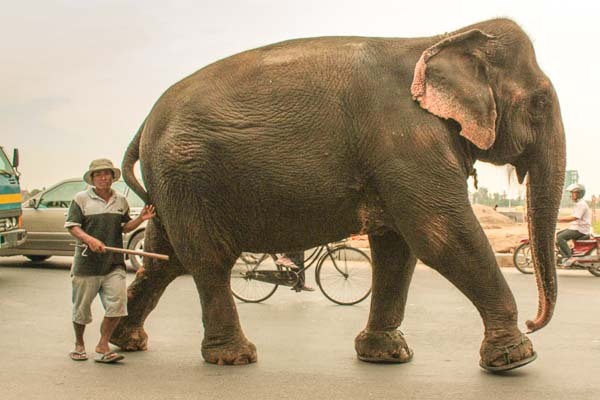 It was rush hour, 5pm, and as I was hanging out I saw a full-grown elephant come walking down the street, minded by her trainer and wearing shoes made from recycled tires. The same thing happened the next day. And the day after that. And that was when I realized how much my life had changed: I no longer thought “Holy #$#!, there’s an elephant in the road!” but instead: “Oh, there’s the elephant. It must be five o’clock”. It’s a wonderfully weird world. A lot of your stories seem to start with, “I was drinking a beer.” I can relate. We should hang out. Bryan recently posted..Want to Save Money to Travel? Then Stay Away from Starbucks!!! Rush hour here in Chico, CA lasts about 7 minutes when more than 8 cars are lined up waiting for the light to turn green. Sure wish we had an elephant in that line. I’m a new reader and these last few weeks I’ve been digging into your blog. I was disappointed when I just saw the length of this latest post. But then I read it and it made laugh out loudly (which many of them do). It was just perfect. Over Saturday morning coffee my husband kept looking at me funny. I tried to explain the squat toilet post and summarize the ear street cleaner experience but I wasn’t having much luck with my story telling skills. Wes, I laughed so hard over this I nearly cried. My exact same realization came in Nepal when I found myself walking down the sidewalk with a huge water buffalo and thought it was entirely normal. Anna recently posted..Dreaming of Living in Auckland? Ha, short and sweet and hilarious. Good stuff dude. It’s wild what you get used to while traveling long term! Seeing refrigerators on the backs of motorbikes stopped surprising me haha. Thanks Johnny. Beautiful picture indeed. I went to Thailand. But never been to Phnon Penh. I wish next trip to be there. Exciting picture of Thailand giant elephant :X thank you :X have you ever trekk Thai jungle on an elephant . It must be a fantastic memories . Great experience. I just recently came back from India and was blessed by an elephant in a temple! Great fun. I also love the shoes on this elephant in your picture. Fantastic Shot! Thanks for the laugh. I can’t believe the Elephant is wearing shoes made out of tired. This could start a new trend! I love having “Meanwhile in xxxx country” experiences. It’s one of the perks of our mobile lifestyle! Wonderful image indeed! I can’t believe the elephant is dressed in footwear created out of exhausted. This could begin a new trend! Great experience. when i sit on elephant when i go for visiting safari. LOVE this. I wouldn’t mind seeing an elephant walk by about now… sigh. Ah yes, your life has changed a lot. I have been blessed to travel all over the world, but that would still be very odd for me. Do you now feel reverse culture shock when you return to the USA? This used to be my life. I grew up in a Eastern India of the 90s, when bullock carts would pass right through town and hold up all sorts of ‘conventional’ traffic, foxes would pierce the evenings with their cries, and the cows would squat pretty much everywhere. But rampant thoughtless urbanization has put an end to all these lovely sights. Ha Ha Ha! Amazing and the way the Guy is acting, seems like its a normal routine for him! Nice! It’s funny what’s normal in some parts of the world … I miss Asia!